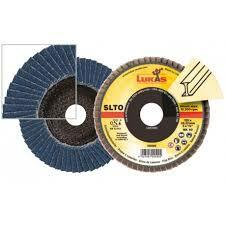 LUKAS offers a flap disc for a wide selection of backing materials (e.g. glass fibre, resin, metal and even with a bio-degradable raw material) to suit every application. The large choice of grit sizes cover high stock removal applications (from grit size 36) to the finish machining application (grit size 240). Where lamellar flap discs are used, you can achieve clear ergonomic advantages compared to conventional grinding discs.